Did You Know This Weeks’s Tiggerific Tuesday Trivia about the Festival of Fantasy Parade? What time is the 3 o’clock parade? This question is a joke among Walt Disney World regulars, you can even see it printed on shirts these days. For the past 5 years that 3 o’clock parade (yes it’s at 3 o’clock if you were wondering) has been the Celebrate a Dream Come True Parade. 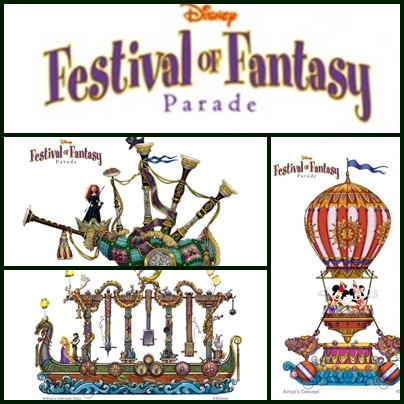 Starting this Sunday (March 9, 2014) a new parade will be debuting at the Magic Kingdom, Festival of Fantasy. The parade will feature many of our favorite films including : Brave, Peter Pan, Pinocchio, Sleeping Beauty, Tangled, and The Little Mermaid. Take a look at one of our recent posts for a peek at the choreography and music. How many cast members will appear in the Festival of Fantasy Parade? The answer is B, 100 cast members appear in the parade. That doesn’t include the cast members behind the scenes making things all come together smoothly, so as you can see these are big productions. Here are a few other facts about the parade you may enjoy. The Peter Pan float features the Jolly Roger flying at 28 feet about the ground. 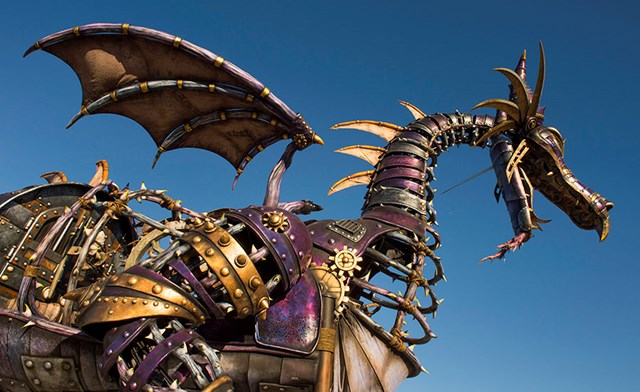 One of the main features, the Steampunk inspired Maleficent Dragon is 53 feet long and 26 feet tall. We can’t wait to see this parade in person later this month. Did you know today’s Trivia Question? What is your favorite Disney Parks Parade? It’s time to get your wait worth at the Magic Kingdom. At the parks you will have to wait in lines, we all know that. 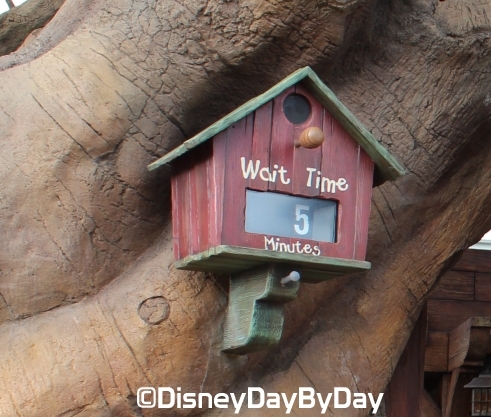 What attraction has the longest duration so I can get the biggest bang for my wait time???? What would you think is the longest duration attraction at the Magic Kingdom??? The Hall of Presidents comes in at the top of the list with 22 minutes and 48 seconds of attraction time. Here is the top 6 or 8 to help you get you wait time worth. Why not a top 5? Well, because I love Splash and wanted to include it. Did You Know Today’s Tiggerific Tuesday Trivia About Olaf from Frozen? Disney’s Frozen continues to be a huge success at the box office and in product sales. One of my favorite characters from the film is Olaf the hilarious snowman. But Olaf wasn’t as simple as building a snowman in your front yard (which many of us can today with the cold weather). To animate Olaf Disney had to create a new software program called Spaces. 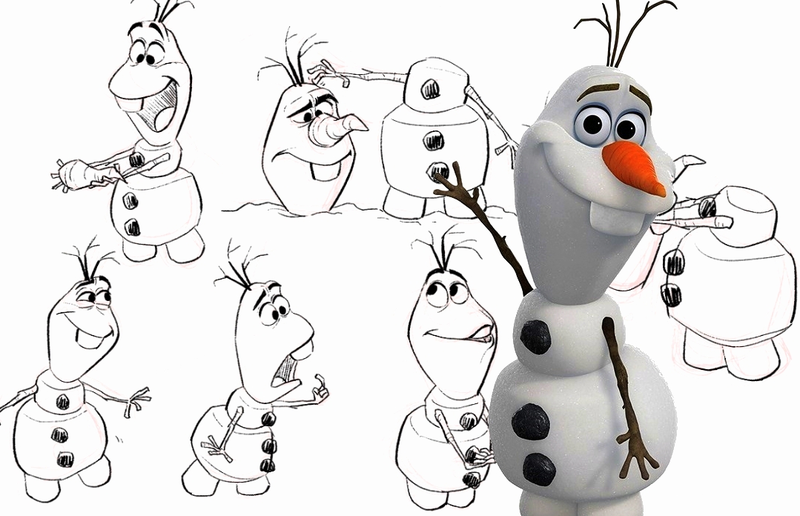 Spaces allows artists to deconstruct Olaf and rebuild him as part of the animation process. “For the animation team, Olaf was like a giant toy box,” says director Chris Buck. “He’s made up of three balls of snow that can break apart and come together in different ways. His eyes can move around, his nose can slide in and out and off. His stick arms came off. Animators could do anything with him.” Sounds like the animators had as much fun creating him as we did watching him. What’s your favorite Frozen Character? Tiggerific Tuesday Trivia: How many Cookies?? Did you know this Tiggerific Tuesday Trivia about Mickey’s Very Merry Christmas Party?? Wishing everyone a Merry Christmas, enjoy your time with friends and family. Thanks for all your support this past year, we look forward to bringing you more Disney each and every day for years to come. 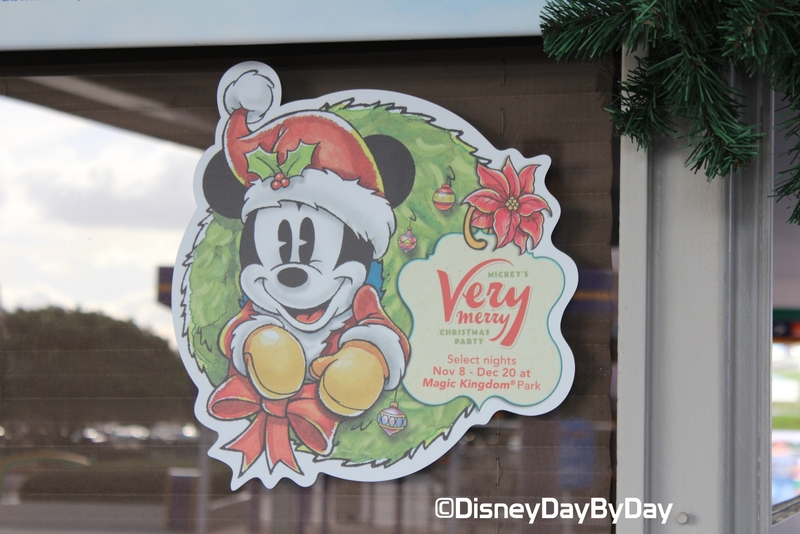 Did you get a chance to visit the parks and attend the Very Merry Christmas Party? 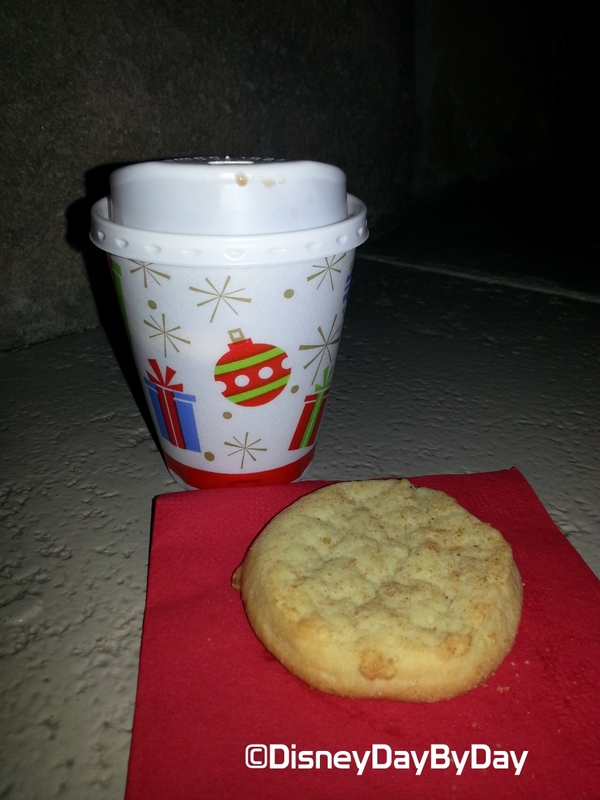 Remember those lines for cookies and hot coco? Hmmm how many cookies do you think Disney gives out on one night during the party? Answer D – 300,000. During a Mickey’s Very Merry Christmas party around 300,000 cookies and around 1,200 gallons of hot coco are handed out. Guess there is no complaining now when you bake your cookies today. If you missed the party and the parade – here is a look at the parade. 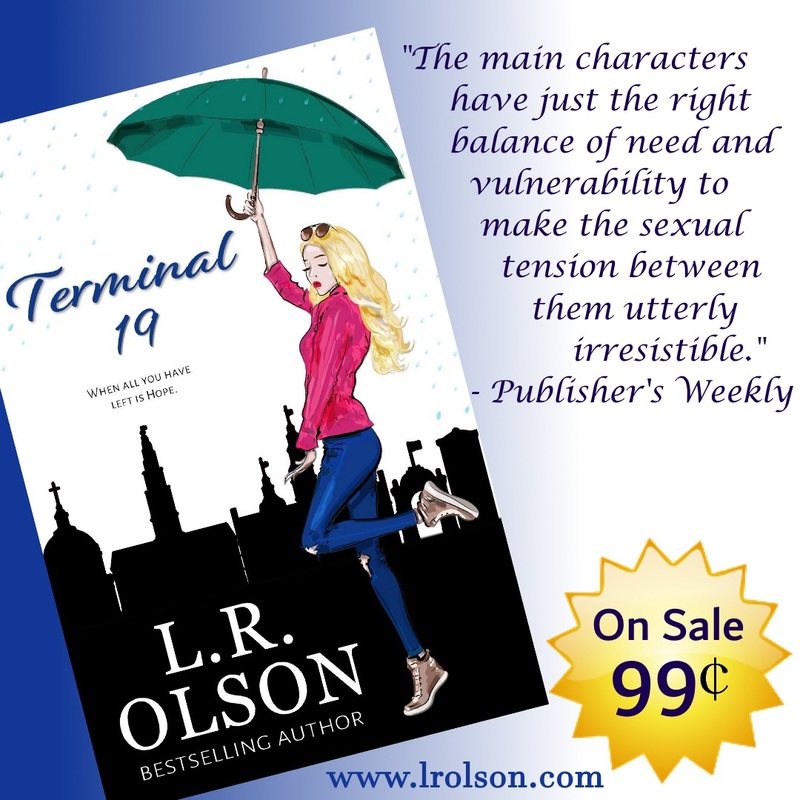 Don’t miss our latest Giveaways!!! 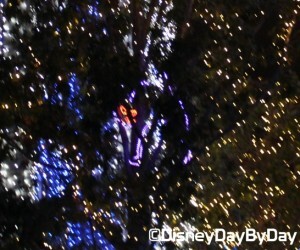 Did you know this Tiggerific Tuesday Trivia about the Cat in the Osborne Family Spectacle of Dancing Lights? It’s a beautiful time of year at the parks, this past Saturday we spent some time under a heavy downpour admiring the Osborne Family Spectacle of Dancing Lights. As we neared the entrance to Lights Motors Action we spotted this years hiding spot for the Osborne Cat. Did you ever wonder why this cat is in a Christmas display? 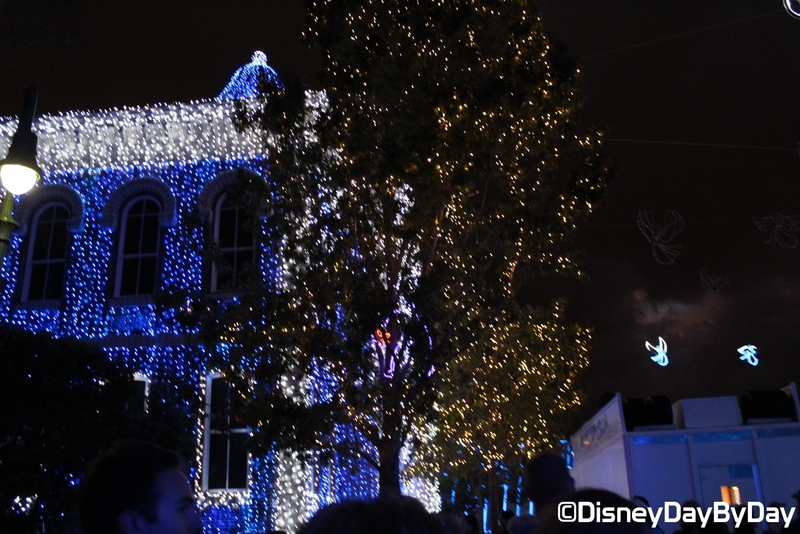 As you know the Osborne family started the light tradition in 1986 with only 1,000 red lights. The display grew to 3 million lights in 1993, because of the size of the display and the crowds it caused the family was faced with court battles to shut it down. Luckily Disney approached the family about bringing the display to the parks and now at over 5 million lights we all get to enjoy it every year. But, what about this cat, well when the trucks loaded up the display a cat from the Osborne’s Halloween display was mistakenly loaded. The team at Disney was prepared to send it back to the Osborne’s but the family said just to keep it and rather than throw it out the team at Disney decided to have some fun and hide the cat in a different spot each year. 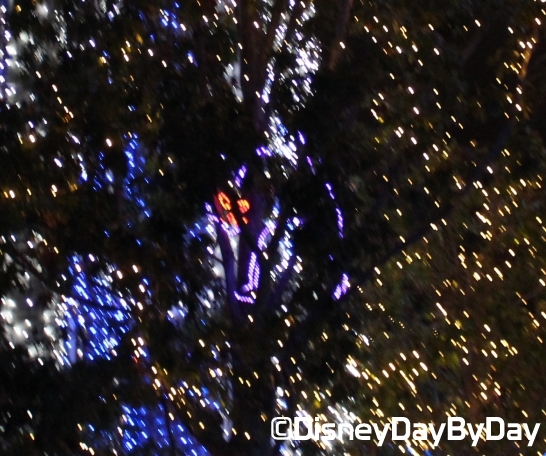 Take a real good look in the tree…..
Can’t make it to the parks for the lights – here is something to tide you over…..
I’m tired, my legs hurt, look at these blisters; yes all conversations heard as you walk the parks on your Disney trip. But just how much are you walking? 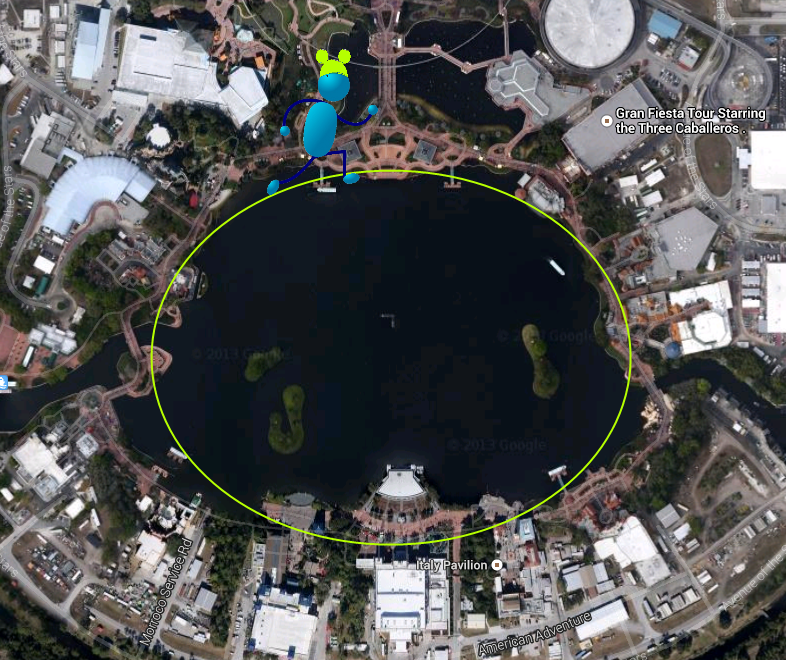 Let’s take a look at World Showcase, as it’s a clear start and end to your journey, unless you back track. 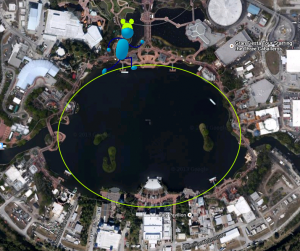 What is the distance around World Showcase Lagoon? We always start in Mexico and work our way to Canada, but no matter which way you turn you are walking 1.2 miles (C). At the Magic Kingdom if you walk from the entrance to the Castle you have walked .25 of a mile which means you will have to walk to the castle a couple times to get a mile in. Yes, it’s a lot of walking, but you don’t even realize how much, on average a person will walk 6 – 10 miles a day at any given park if you are there for much of the day. How much do you feel like you walk while at the parks?